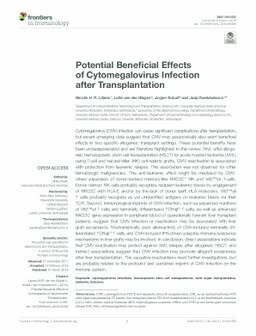 Cytomegalovirus (CMV) infection can cause significant complications after transplantation, but recent emerging data suggest that CMV may paradoxically also exert beneficial effects in two specific allogeneic transplant settings. These potential benefits have been underappreciated and are therefore highlighted in this review. First, after allogeneic hematopoietic stem cell transplantation (HSCT) for acute myeloid leukemia (AML) using T-cell and natural killer (NK) cell-replete grafts, CMV reactivation is associated with protection from leukemic relapse. This association was not observed for other hematologic malignancies. This anti-leukemic effect might be mediated by CMV-driven expansion of donor-derived memory-like NKG2C+ NK and Vδ2negγδ T-cells. Donor-derived NK cells probably recognize recipient leukemic blasts by engagement of NKG2C with HLA-E and/or by the lack of donor (self) HLA molecules. Vδ2negγδ T cells probably recognize as yet unidentified antigens on leukemic blasts via their TCR. Second, immunological imprints of CMV infection, such as expanded numbers of Vδ2negγδ T cells and terminally differentiated TCRαβ+ T cells, as well as enhanced NKG2C gene expression in peripheral blood of operationally tolerant liver transplant patients, suggest that CMV infection or reactivation may be associated with liver graft acceptance. Mechanistically, poor alloreactivity of CMV-induced terminally differentiated TCRαβ+ T cells and CMV-induced IFN-driven adaptive immune resistance mechanisms in liver grafts may be involved. In conclusion, direct associations indicate that CMV reactivation may protect against AML relapse after allogeneic HSCT, and indirect associations suggest that CMV infection may promote allograft acceptance after liver transplantation. The causative mechanisms need further investigations, but are probably related to the profound and sustained imprint of CMV infection on the immune system.